We have always known that Rooibos was healthy. But, honestly, the benefits that research is now showing Rooibos to have are surprising everyone. Most of these studies are human, animal or in vitro studies, but there is nothing that shouldn’t carry over to Rooibos for horses. Rooibos, aka Aspalathus linearis, is unique to South Africa. The Khoi tribes in the mountainous Cedarburg region of the Western Cape were the first to brew it into a tea. Since then, South Africans have continued to enjoy this tea and lately, Rooibos has become a vibrant export industry. Most of these benefits are as a result of the unique line-up of bioflavonoids present in Rooibos tea. Bioflavonoids are bright yellow molecules which are found in plants. The main bioflavonoid in Rooibos is aspalathin, which isn’t found in any other plant. Bioflavonoids are potent anti-oxidants. A lot of problems in your horse’s body are caused by free radicals. These are unstable molecules which are highly reactive and can cause damage to DNA (which can lead to cancer) or can oxidise cholesterol (which can lead to strokes, heart attacks and clogged blood vessels). Bioflavonoids ‘mop up’ the free radicals by binding to them and thus making them harmless. Apart from having its own anti-oxidants, Rooibos has also been shown to increase the body’s own super-antioxidant Glutathione fourfold. Glutathione can’t be taken as a supplement because it gets broken down during digestion, but it a hugely powerful anti-oxidant. This increase in anti-oxidant activity explains why Rooibos is recommended as a preventative against cancer, strokes, heart disease, ageing, etc. In addition, another study found that Rooibos prevented liver damage in rats which were fed a liver-damaging chemical. ‘These findings provide biological evidence that Rooibos can protect the liver and that it has potential to be used as a supporting treatment for liver disorders,” says Dr Wale Ajuwon, the scientist who lead the study. 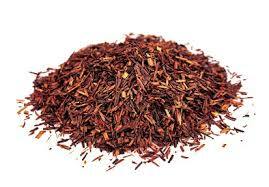 A Japanese study found that Rooibos had a modulating effect on Interleukins, molecules involved in allergic reactions. Stellenbosch researchers found that Rooibos also slows down the production of Cortisol, the ‘stress hormone’. Cortisol causes all sorts of problems in horses – anxiety and a lower immunity being just two. This is only a fraction of the studies done on Rooibos. As a general, cost-effective supplement for horse, it is hugely valuable. Don’t even bother making a tea – just add a couple of small handfuls to the feed. It smells delicious and it packs a massive health punch. If you’d like to buy some Rooibos for horses, click here: https://www.horseandpethealth.com/buy/rooibos/. I love to read new and interesting articles like this. Thank you for the nice article. Do you know if rooibos tea can help to increase a horse’s appetite? I am situated in SA and when ever I go to an unfamiliar place with my horse, he loses his appetite. I don’t want this to affect his performance and I also don’t want to stay longer than one day at an event because it makes me worried. Years ago the hospitals used concentrated rooibos tea to increase the appetite of their ill patients. This isn’t something that I have heard of before but it is quite possible. Maybe give it a try…. I think it is definitely worth trying, Lorraine. Really enjoyed your article on the benefits of rooibos tea.